The Dragons (drah-gkon and dov-rha to the ancient Nords, or dov in their native language) are a rarely-seen race of large reptilian beasts. They are rumored to be from Akavir (which literally means "Dragon Land"), though there are ancient tales of dragons also coming from Atmora. They are large, scaled creatures, easily several times larger than a human or elf. They have long, slender extremities, with thin bat-like wings and ridges of spikes along their back. Dragons have three sharp talons and one vestigial digit known as a dewclaw on each of their legs, as evidenced by their alphabet. Dragons are well-known for their affinity for magic which, among other things, grants them the abilities to speak and fly despite their lack of lips or aerodynamic frame. There are several varieties of dragon that come in a range of colors. Blessed with remarkable intelligence, they are nonetheless susceptible to feelings of pride and melancholy. They are distrustful creatures, even of each other. Despite this, they are also somewhat social, and can be driven mad by captivity and isolation. As the immortal children of Akatosh, they are specially attuned to the flow of time, and they feel an innate urge to dominate others that is difficult to overcome. In the mind of a dragon, being powerful and being right are the same, thus they make no distinction between speaking and fighting; battles between them are actually deadly verbal debates. It is rumored that Tosh Raka, leader of the Tiger people of Ka Po' Tun in Akavir, has succeeded in transforming himself into a dragon. 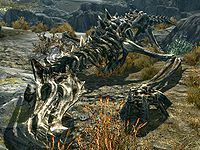 So-called "Dragonlings" found around the Iliac Bay area are actually over-sized lizards unrelated to the progeny of Akatosh, who are larger, smarter, and much more deadly. Daedric Titans were first created by Molag Bal in imitation of the dragons. According to the writings of Archmage Shalidor, dragons had existed since the advent of time, but were initially as wild as anything else. It was Alduin, Firstborn of Akatosh, who created their civilization. Nordic legend says that, in these early years, the dragons were the only creatures who could harness the power of their voice for great feats of magic, though they only did so in times of "True Need". Dragons are believed to have lived in and around isolated mountain villages. The villages were purportedly situated in areas that allowed flight free of obstructions as well as flats for raising cattle. There is even some indication they practice smithing. Dragons are also thought to prefer solitary mountain lairs safe from thieves and aggressors. During the Merethic Era, Dragon Priests kept the population enthralled and obedient by means of a widespread dragon-worshipping cult, and many people of this era became the undead draugr that still prowl the crypts of Skyrim, Solstheim, Atmora, and anywhere else the dragon priests "kept peace between dragons and men". The center of power in Skyrim of this dragon empire is thought to have been Bromjunaar, where dragon priests decided matters of their law. Nordic legend holds that Alduin led his brethren and their once-benevolent minions to terrorize and subjugate the mortal races, triggering a rebellion. The dragons began indiscriminately slaughtering them under the orders of Alduin, who had chosen to forsake his proper duties and conquer the land. During this Dragon War, mortals found ways to kill the dragons, who were previously thought undefeatable. Some people, notably priests of the Nine Divines, claim that Akatosh intervened against the dragons to help end the war, and that some dragons fought against their own kind. The dragon Paarthurnax took pity on the Nords (purportedly at the request of Kyne), and instructed several in the ways of the thu'um so that they could channel the power of their own voices using the tongue of the dragons. These first Tongues (masters of the Voice) used their new power to turn the tide of the war, and they eventually "shout[ed] Alduin out of the world". The remaining dragons were hunted and killed until they were nearly extinct, clearing the way for the many empires which have risen and fallen since. Dragons became more elusive after losing their grip on power. Their numbers dwindled over the years due to many causes: their population in Akavir was wiped out by the Tsaesci, who also brought their onslaught to Tamriel, and the dragons in Vvardenfell were overrun by invading cliff racers. The Akaviri Dragonguard and its successor, the Blades, along with other heroes, hunted dragons and their followers throughout the eras until dragons were nearly extinct. Tiber Septim offered those who remained protection in return for their fealty. Despite his pledge, almost all known wild dragons were killed or driven off, disappearing from sight in Tamriel. Some sources claim that all dragons disappeared at once, being devoured by a dragon king or absorbed by Tiber Septim when he ascended to godhood. Many held the belief that the dragons were extinct. This was not true, as live dragons continued to exist throughout the Third and early Fourth Era. Nomads in the Alik'r Desert frequently spoke of "Great Wyrms" inhabiting its vast wastes, although these claims were never independently confirmed. The Akatosh Chantry hold dragons as their holy symbol, and keep tamed dragons in their "sacred grove". Many ancient legends tell of dragons making deals with other races to protect themselves. 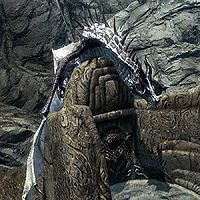 According to Brarilu Theran, at least one dragon is known to have laired in the smoking ruins of Vvardenfell after the Red Year, long after the cliff racers were driven off by Saint Jiub. 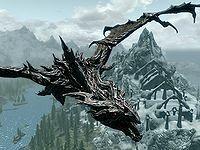 After being largely absent from the affairs of Tamriel for hundreds of years, dragons reappeared en masse in Skyrim and Morrowind in 4E 201 thanks to the return of Alduin. The Firstborn of Akatosh, who had been transported through time by the ancient Nords, was able to resurrect many of his fallen brethren, as only the dragons and Dragonborn have the power to permanently kill a dragon by absorbing its soul. The Last Dragonborn of prophecy emerged to defeat Alduin and absorb the souls of many of the dragons he unleashed. The fate of the remaining dragons is unknown. Alduin - First-Born of Akatosh, bringer of the end times. Boziikkodstrun - A dragon who was transformed into the first Daedric Titan by Molag Bal. Dragonne Papré - A dragon who lived in the Battlespire. Durnehviir - An undead dragon who guards the Soul Cairn. Nafaalilargus - A soldier of Tiber Septim. Slain by Cyrus the Redguard. Numinex - A legendary dragon who was imprisoned for many years by King Olaf One-Eye. Odahviing - A red dragon who allied himself with the Last Dragonborn. Paarthurnax - Younger sibling to Alduin, and the one responsible for teaching the Nords how to use the thu'um. Skakmat - Nulfaga's familiar, who created the dense fog at the Battle of Cryngaine Field. Tosh Raka - The king of the Ka Po' Tun, who, according to popular myth, was transformed into a dragon. ^ a b Loadings screens in Skyrim. ^ Arngeir's dialogue in Skyrim. ^ Events during the Oblivion Crisis. This page was last modified on 31 March 2019, at 13:49.